FIXYOURTHINKING.COM / Need a brain? Borrow mine! : The Very Phishy Wishy Washy Parallel Between OLPC & The Tablet Formerly Known As "The Crunchpad"
The Very Phishy Wishy Washy Parallel Between OLPC & The Tablet Formerly Known As "The Crunchpad"
For those of you that follow this site ... you're aware that I've had my reservations about the One Laptop Per Child program from its inception. 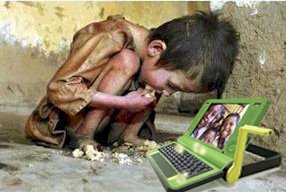 I Hate Children And Their Little Laptops Too! In this piece, I indicated that the OLPC laptops are really nothing more than a light ponzi scheme and that the $100 price tag most likely is a penny, a dime, or a dollar too much. The goal of the OLPC program, headed by Nick Negroponte, is to distribute 1 BILLION laptops to children. Just a penny shaved is $10 Million dollars to pocket if the program was to reach it's one billion distribution target. Just an opinion, but I think Mike Arrington was planning some sort of similar boondoggle as the OLPC program with his "CrunchPad" and most likely FusionGarage caught on. TechCrunch is a blog company that profiles startup companies, products and websites. It was founded by Michael Arrington in 2005. The blog's first post was on June 11, 2005. Just a hunch, but I'd bet that Arrington was lining up deals with publishers to line his own pockets. Arrington wanted publishers to subsidize the Crunchpad and for FusionGarage to manufacture the hardware and shave a few dollars here and there for a volumetric profit - a la the OLPC program. What Arrington didn't realize however is that he's not dealing with unwitting, non sensical spending government entities - he's dealing with businesses that are cut throat and solely focused on their bottom line - businesses that will toss you out on a technicality at any point they can. After all, if you are getting a cut, you are an expense. In the "game of OLPC" and pitching it to governments around the world there's also a lot of goodwill recognition. In private enterprise, few people could care about what goodwill you have or if you want to change the world - something Arrington promised with his internet tablet and the magazine and newspaper publishing empires. Base Your Business On How Your Partner Looks ..."
Pixel Qi has been closely followed in the industry as it was founded by One Laptop Per Child's (OLPC) former Chief Technology Officer Mary Lou Jepsen. This technology was developed (most likely) under the OLPC project - PixelQi is a "for profit" company. So, OLPC served as a great "free research and development firm" for this new display.